The ultimate goal of your business is to acquire new customers and make sales – but how do you figure out the areas of your business that may be preventing this from happening to its best capacity? Business exists in a world of big data. This sounds exciting on the surface, but what does it really mean? The more information we have available, the easier it becomes to make the right decisions – or so it seems. Unfortunately, big data all too often leads to clutter. Instead of clarity, we have noise. Instead of using data to guide the business we find ourselves working in the business reacting to events. Focusing on the metrics that matter is the remedy to the weight of big data. In Eliyahu M. Godratt’s book, “The Goal,” he introduces us to the theory of constraints. Though the book reads like a novel and uses a factory as its business, this theory can still be applied to your business as well. Basically, the theory of constraints states that the step within a process with the smallest capacity – the constraint – dictates throughput. But what does that mean? Let’s get right into it. In the client acquisition cycle, the “throughput” is revenue (do I have your attention now?). Revenue represents success in acquiring and onboarding new clients – the fuel to sustaining business growth. Businesses inevitably lose existing clients over time. Without actively working to acquire new clients, businesses will eventually contract. Organizations preferring to use a metric other than revenue as throughput need to identify the target. Throughput must be an appreciable, objectively measured target that is the goal of a cycle or process. Businesses that focus on high blended ticket value will shift their strategy to higher paying prospects. Marketing tactics will be altered to avoid lower paying prospects. Marketing becomes responsible for motivating the right prospects to respond and not the total prospect responses. Client acquisitions will be reduced by avoiding smaller sales. This can be accomplished by an outright refusal to serve low need prospects or increasing basic service fees to dissuade lower paying consumers from becoming clients. Setting goals of acquiring as many new clients as possible and simultaneously raising the blended average ticket value creates a conflict of Throughput. These conflicts can be navigated by carefully designing goals – defining Throughput – based on the best interests of your organization. Revenue works by establishing Throughput that avoids conflicts. Other organizations may focus on a different metric. New client acquisition may be the right Throughput for organizations that are focused on increasing market share (e.g. a new business). The key is ensuring that each departmental goal works in collaboration with the other. The client acquisition cycle can be broken into several linear steps. Any step can act as a constraint, straining efforts to grow the business. A business’ ability to acquire new clients efficiently is reduced due to the constraint. Expensive client acquisition costs, missed growth targets, and reduced throughput are the results of constraints. Client acquisition, and business growth, can be likened to a manufacturing assembling line. Manufacturing requires each unit produced be processed by a series of individual machines before the end goal of sales throughput is achieved – sales throughput being the final sale of the unit to the end customer. The machine with the smallest capacity dictates the number of units produced. For example, if machines A and B have a capacity of 100 units, machine C a capacity of 50 units, and machine D’s capacity is 500 units, only 50 units can be produced. Maximizing machines A and B to their fullest potential will still yield only 50 units to throughput. Machine C cannot process more than its limited capacity. The relationship sales cycle is a similar process. Client acquisition for businesses engaged in relationship sales tends to have a longer cycle, as opposed to transactional sales. Understanding the individual steps and the steps influence the process overall helps create a manageable process. Each client acquisition navigates through these steps. Each step is measured discretely. The above example demonstrates how a constraint negatively impacts new client acquisition and revenue. Each step is individually measured providing insight into where the constraint exists and where we should target our resources. The constraint is found in the second step of the process. The Connection step is dictating Throughput or the revenue earned. All other scores remain constant. The number of Acquisitions remains at 85% of Evaluations, for example. Generating leads is the first step in acquiring customers. Businesses cannot grow beyond the number of leads generated (this may seem obvious). Any activity intended to create awareness of the business, including a website, digital ads, direct mail, print ads, networking, etc. comprises this step. This is the marketing activity. Success in this activity means driving prospect response, or garnering prospect calls. The marketing dollars are used to “purchase” prospect calls, appointments, and ultimately new clients. New client revenue can be expressed as the monetization of the dollars invested in marketing efforts. Although the intent of marketing dollars is to drive revenue from client acquisition, prospect calls are the measurement of success for this step as all the other steps directly influence client acquisition. Prospect calls indicate the effectiveness of marketing activity. In the scenario illustrated above, the same volume of prospect calls based on the same marketing budget and activity occurs, yet different Throughputs are achieved. 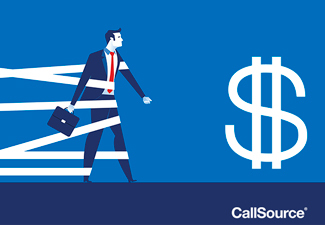 A common response is to purchase additional prospect calls with additional dollars to make up for the revenue drop off. This results in expensive client acquisition costs. The ability to effectively monetize the marketing investment becomes out of balance. Marketing costs comprise a higher portion of the overall cost of gaining new clients. Marketing efforts, or the Awareness stage, acts as a constraint if all other steps are operating efficiently. As the first step in the client acquisition cycle, it effectively caps the number of opportunities. If 100 prospect calls are generated, client acquisition opportunities are limited to 100 for the time period being measured. Setting goals for each phase helps identify the constraint. If the organization is hitting its conversion rate target (Connection Phase) then this can be eliminated as the constraint. If it is determined that all other steps are meeting their targets, and the business wants to grow beyond its current rate, then marketing should be examined. Even if it is determined that marketing is not the constraint, additional marketing may succeed in expanding the number of prospect opportunities. Careful analysis will determine if this is the appropriate option based on individual circumstance. Setting the appointment is the second step in generating sales throughput. The Connection phase is the first time the organization has direct contact with a prospective new client. If the opportunity is handled effectively the relationship advances by setting an appointment for an evaluation. Being ineffective may result in permanently losing the opportunity. Some clients may focus on setting a specific number of appointments, but the conversion rate provides a clearer picture if appointment setting is a constraint. The total number of appointments set is impacted, positively or negatively, by marketing response rates and seasonality. Below-average conversion rates indicate appointment setting is a constraint. In the example above, even a relatively small drop will have a significant negative impact on client acquisition and revenue. The longer the constraint exists the more expensive it becomes. Call handler skills are likely lacking in one or more areas. Identifying opportunities for skills training is important. CallSource recommends setting specific goals for call handlers and reviewing scores on a regular basis. There are three prospect outcomes to the Connection phase: Fostered, Lost, or Nurtured. Fostering the relationship is setting the appointment on the initial call. The prospect has the opportunity to become a client during the evaluation stage. The call handler succeeded. A positive brand experience was provided and the relationship is progressing, which is the goal of the stage. A lost opportunity occurs when the prospect has a brand experience that does not meet their needs. A high risk of defection to a competitor exists. Nurturing the relationship occurs when the prospect is not able to set an appointment on the initial call, but has a positive brand experience. This encourages them to book when they are ready to move forward. Some industries lead nurturing plays a small role and other industries it is essential. Lead nurturing often occurs when the caller is conducting research on behalf of someone else, such as a parent or partner. Schedules will need to be confirmed prior to booking an appointment. Conversion rate is a vital leading indicator of success even in industries with a significant lead nurturing need. Conversion rate is arguably the most important indicator of performance in most industries and especially those that must book on the initial call or lose the prospect. A high success rate on the initial call translates into more appointments booked overall. Prospects form immediate opinions of the business during the initial call. A positive brand experience means the call handler effectively communicated the value of the business. If questions were not adequately answered, if the call handler sounded indifferent, or an appointment was not offered the prospect will likely not set an appointment. They may defect to a competitor or decline to seek service at all. CallSource measures the brand experience using the Telephone Performance Analysis, or TPA. A strong brand experience has a higher likelihood of setting an appointment. Conversely, a weaker experience has a higher rate of missed opportunities. This results in a longer acquisition cycle or a constraint. Recapturing missed opportunities is the second aspect of eliminating appointment setting as a constraint. Even businesses with strong conversion rates and provide a positive brand experience will have some missed opportunities. Maximizing appointment setting to its fullest potential reduces limitations to business growth and maximizes marketing spends. Outbound calls to missed opportunities reduce defection rates and prospects that will not move forward any service. A missed opportunity is a prospect that expresses an interest in a product or service but does not book an appointment for a specific day and time. Should a poor brand experience occur, it is imperative to reach out to the missed opportunity and correct that experience. Lead nurturing campaigns include outbound calling. These missed opportunities are prospects genuinely interested in a service but were prevented from booking an appointment on the initial call. Successful lead nurturing requires an active approach. Passively waiting for the prospect to call again is a lead nurturing strategy based on hope. Outbound calling missed opportunities boost the effectiveness and expands the capacity of the Connection step. During the evaluation step, the prospect’s needs are determined. The evaluation may determine that some prospects do not require service. This is not an example of a constraint. This is a lead nurturing opportunity. When the person will benefit from being served there is a likelihood they will return to this organization due to the positive brand experience (or refer someone). The Evaluation constraint typically comes in two forms: cancelled appointments and the inability to move the prospect to pay for a beneficial service. A high rate of cancelled appointments undermines the effectiveness of the first two steps in the client acquisition process. The marketing provided a prospect response. The call handler moved the prospect to setting an appointment. Appointment reminders may be effective. This is a valuable and low investment effort to motivating prospects to keep their appointments. Prospects booking future appointments (not same day) will benefit most. A simple call the day before may be all that is needed. If the prospect is required to travel to the business for the appointment, ensuring (S)he has transportation may be helpful. Not every professional prefers to consider him/herself a salesperson. Yet every success business organization requires sales. Sales is simply moving someone to purchase a product or service that benefits that individual. Moving the prospect toward a purchase requires effective communication. Communication is not complete until the listener receives – hears and understands – the message. Communication may be the issue if the constraint is at the evaluation stage. Is your communication effort unnecessarily complex (jargon or abstract language)? Have the benefits of service been clearly articulated? Do you understand the prospect’s reluctance? Have you made a full effort to understand the prospect? Improving sales requires altering approaches and experimentation. New efforts may not immediately gel. Being prepared to learn what works, and what does not, is a necessary part of the sales process. Some businesses have grown beyond their ability to actually schedule the service for all prospects. Scheduling availability essentially determines or limits the size of the business in these cases. In these situations, the marketing is effective and connection phase is not an issue. When 80% of scheduling capacity is reached, businesses start considering their options. Many CallSource clients would love to have the problem of filling all available appointments. Appointment slots are a perishable product. At the end of the week any unused appointment times can never be sold. The revenue that could have been generated from those unused appointment slots will never be generated. Businesses that reach their maximum scheduling capacity must turn away some customers. These unscheduled prospects may be permanently lost customers. Expanding scheduling capacity may not always be feasible for any number of reasons. This is especially true if scheduling capacity is a constraint during brief peak seasons. It rarely makes business sense to boost capacity for only a short period. Businesses purchase prospects with their marketing. The phone does not ring for free. Prospects that are turned away represent a wasted cost. If a client does not wish to expand scheduling capacity they have some options. Reduced marketing is an obvious choice. Reviewing current marketing and eliminating underperforming sources is a worthy exercise. Cut marketing costs immediately improves the bottom line. The client no longer purchases prospects that are ultimately wasted. Clients still need to market their business. Cutting marketing too much, too quickly, may lead to a lack of prospects. Any reduction in marketing should be a methodical process. An overabundance of prospects allows businesses the luxury of being selective. Turning away low margin prospects to focus on higher paying customers may reduce scheduling constraints. Since there is a scarcity of appointment slots, the value of the appointment increases. Businesses should understand the value of their appointments and strategize accordingly. This will not increase scheduling capacity, but may help boost revenues by granting appointments to higher paying customers only. Raising fees will need to be considered against market forecasts and branding concepts. The prospect is not actually acquired unless they can be scheduled. Growth constraints may shift over time. This may be temporary, signal an emerging problem, or due to fixing a previous constraint. Marketing or scheduling may act as a temporary constraint due to seasonality. Conversion rates may ebb and flow due to a number of factors. Acts of intervention are unnecessary for temporary issues. Expanding the capacity in one area may make another area in the sales assembly line the constraint point, even if its capacity remains steady. Marketplaces change overtime. A commitment to monitoring the metrics enables business leaders to identify constraints and take action. Although not directly part of the sales process, a business’ operational capacity impacts growth. Time resources are one example of operational constraint. A Business leader may only be able to successfully manage a business of a particular size. Business growth requires the investment of managers beyond this point. Business owners may be reluctant to invest in operational support due to the added risk. Talent limitation is another area of operational constraint. As a business advisor, we may not be able to address these issues directly, it is important to be aware of such limitations as you work with clients. Throughput cannot be controlled. The end result of any process can never be controlled. It is a lagging indicator of the preceding steps in the process. The leading indicators – the steps in the client acquisition process coming before throughput – can be controlled. Focusing time, energy, and resources toward correcting growth constraints will positively impact business growth.